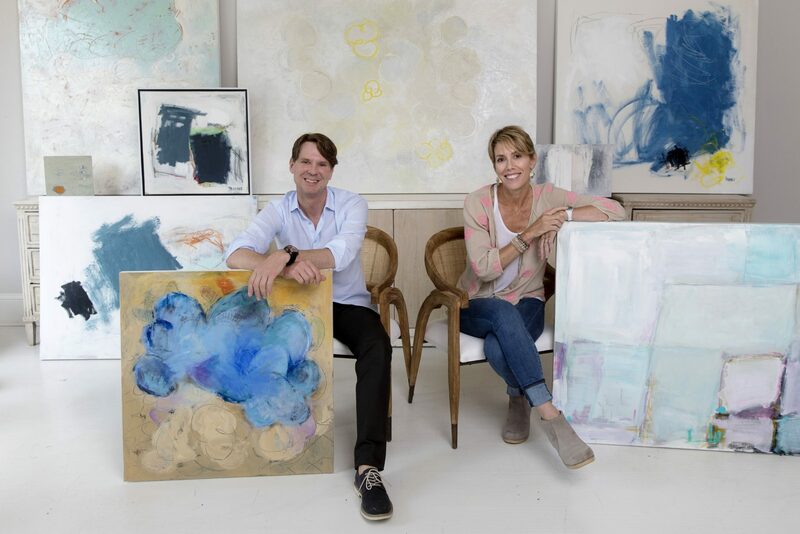 Artists Sarah Trundle and Duane Cregger had not met before they arrived at Palette Home with their paintings last month to be photographed for the July/August 2018 feature & upcoming show. 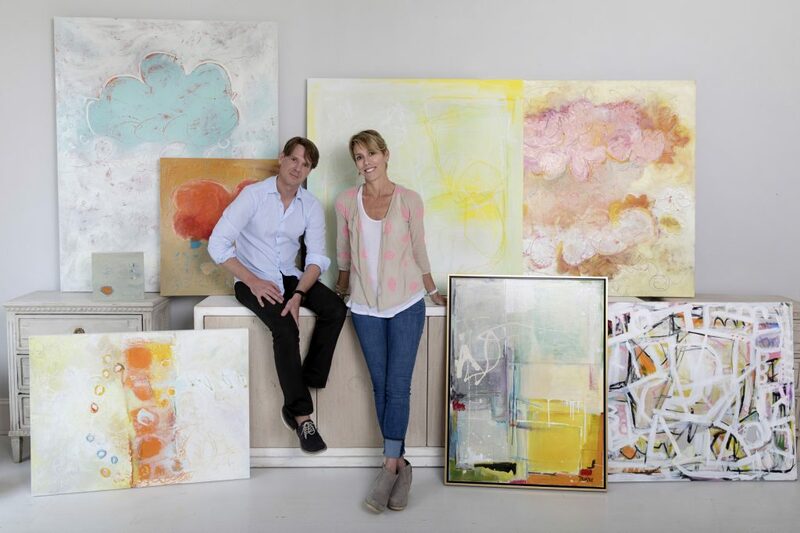 We were so charmed by the instant chemistry between them and their paintings! Both artists have created an impressive body of more than 40 large works that we can’t wait for you to see. OPENING RECEPTION IS THURSDAY, JULY 12th 6PM -8PM. JOIN US! Getting to know Duane and Sarah . . .
Sarah: I grew up in what was then a fairly small town outside of Philadelphia called Chester Springs. Beautiful, pastoral, remote. It reminds me a lot of Charlottesville, Va which I have now called home for 21 years. Duane: I grew up in the Blue Ridge Highlands of Virginia, near the Tennessee and North Carolina borders. I lived in Washington, DC, for 15 years before returning to my home. These very different lives work together to inform my work. Duane: My paintings are an enigmatic and intimate abstract narrative of a personal journey shaped by the tension between rural and urban influences. One of my goals is to promote the idea of contemporary art as an Appalachian form through building awareness and community around exhibitions, mentoring, and engagement with other artists. This also includes introducing the idea of “Appalachian Contemporary” to urban areas where I have a connection. Urban and rural are not mutually exclusive; they complement one another, and I see my art as one way to build bridges, artistically and socially. Duane: I’m not trying to communicate with my art. I’m simply allowing the art to come forth and speak for itself. The moment I intend to communicate something, the creativity and inspiration are gone. Sarah: I don’t really think I’m trying to communicate anything, except maybe that life is messy, mistakes can be made, there is no perfection and no direct linear route from point A to point B. Really, I’m just trying to finalize a journey that starts, for me, with the first mark I put on a brand new canvas. If someone else happens to like the end product of that particular journey of mine, then clearly my painting is speaking to them, and inviting them in to ponder the hows and they whys and the whats of that piece, and hopefully come to their own unique interpretation of it. But I do hope they see a bit of the struggle that went into it. And take inspiration from that. That struggle to me is a crucial piece of any painting as a whole, and I do strive to keep that apparent in the finished product. PH: What kind of creative patterns, routines or rituals do you have? Duane: Sometimes when I feel like going to the studio is a challenge, or I feel creatively tired, I will build a random birdhouse and paint it. It never fails to get things moving again. I have 15 nestled in the trees outside my studio. Sarah: Well, I paint from a home studio and can’t imagine it any other way. I “show up” in my grubby paint splattered sweat pants and get to work. I love the privacy and the solitude, the ability to pop in and out to make quick, singular, changes if needed, without always having to commit to spending a whole day “in the studio”. And I’ve never been very good at talking while I paint; I don’t even like people watching me, so any kind of a shared or social studio setting would not work well for me. I would get nothing done! PH: When do you get the biggest surge of inspiration? Sarah: I think most of my inspirational light bulb moments come from what I consider “accidents” or just incidental by-products of my painting process. 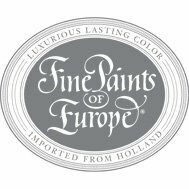 For instance I might put down two colors somewhat randomly, or haphazardly use a certain kind of brushstroke, or wipe or scrape off paint that I don’t like, and all of a sudden I’m smitten with what I see. Those two colors side by side, or those marks, or that “technique” might then change the course of that particular painting or give me ideas for future paintings. PH: What’s the best advice anyone has ever given you about how to be creative? Sarah: The idea that nothing is too precious. Which to me translates into, dont be afraid to to risk “ruining” a painting, that “mistakes” are part of the process and often seminal to our best works. That is truly the case for me and largely what compels my process. PH: Any recent travel inspiration? Duane: Mexico City …. A profoundly inspiring culture: art, food, music, the people. The juxtaposition of ancient pre-Colombian art and Spanish colonialism with a modern metropolis was awe-inspiring at every turn. PH: What role do you believe an artist has in the world? Sarah: I see artists as creating pieces that encourage people to expand their brain. To think. To feel. To react. To learn. To hate it. To love it. To wake up. Art gives us something to push against and ponder. Even if we hate it. PH: Any artists in particular that inspire you? Sarah: There are so many but my go-to is Richard Diebenkorn. I love his layering of paint, his consolidation, simplification, and ordering of any underlying chaos. I’ve moved away a little bit from tighter shapes and linearity, but that is where I started and I still consider him one of my main muses. I could stare at his art all day. PH: What about color – do you have a particular color you like to use in your work or some you avoid? Sarah: Well, that changes as I discover and fall in and out of love with new colors and their interplay, but I’m pretty partial to a particular dark blue/ black color that I mix. I’m currently in a phase of working with a lighter, largely white, palette but it’s still hard for me to create a painting without any black in it. It is such a decisive and commanding color. It makes things happen and directs the course of the painting, even if it ultimately gets covered up. PH: How would you say your style of art changed over the years? Sarah: It had changed a lot given that I started painting in a representational style, with oils, and I have since moved into abstraction, with primarily acrylics. Since I have been working in abstraction my work has definitely become looser, more experimental, less planned. But I love that you can see hints of where I was headed in my early representational work- big blocky reductionist shapes, geometric and linear compositions, and bold colors. PH: What is something you like to do to relax? Duane: To relax, I cook. Really good stuff. I like to bake, too. Sometimes, I’ll play the piano for hours. Sarah: Painting is pretty high on my list of relaxing activities. Even if I’m really struggling with a painting, there is a mental laser focus that occurs for me. It’s almost like a meditative mantra. But honestly, not much beats lazing around on a good comfy couch with a pile of books, your phone, a remote, and nothing pressing to do. PH: What was the last book you read? Duane: Turtles All the Way Down, an acclaimed young adult coming-of-age novel about learning to cope with a world is beyond your control. I have a book club of friends from Philadelphia, northern Virginia, and Maryland; we meet quarterly for a fun weekend somewhere under the guise of discussing literature. Sarah: I’m reading it right now and loving it…A Prayer For Owen Meany by John Irving. Amazing. PH: Do you have a favorite room in your house? Sarah: My 13 year old son’s room. It’s slightly cluttered, but in a cozy and organized way, colorful, clearly “lived in”, and full of memorabilia, kid art, sports pennants, and interesting things on the walls almost in an eclectic, gallery style. There is nothing matchy-matchy or too perfect, pristine, or untouchable about it. Its real and you can tell a 13 year old boy inhabits it. And he has the most comfortable bed in the house, so that helps. Duane: My guest room; it is a quiet space without attachments. Serene. PH: Do you have a group or organization you like to support or volunteer? Duane: Beau’s Army, a nonprofit organization that assists families with dogs facing canine cancer. Sarah: I’ve been a hospice volunteer for Hospice of the Piedmont in Charlottesville for the past 8 years and although it sounds cliche, it has truly transformed me. Without a doubt I get as much out of it for myself, as I put into it for the patients. Duane Cregger is contemporary artist working in oils and acrylics. His large, brightly colored and heavily textured works form an abstract narrative of life in Virginia’s Blue Ridge Highlands. Cregger received a Bachelor of Arts in Art from Roanoke College in Salem, Va. He lived in Washington, D.C. for nearly 15 years, with a career in art direction and corporate graphic design; in 2003, he began to paint. Cregger’s work has been featured in Élan Magazine, American Art Collector, Cottage Style by Better Homes & Gardens, Home & Design, Richmond Home, Traditional Home, and the Better Homes & Gardens Home Decorating Guide. His paintings are found in private and corporate collections throughout the United States, including that of actress/director Drew Barrymore, and in Canada and the Caribbean. 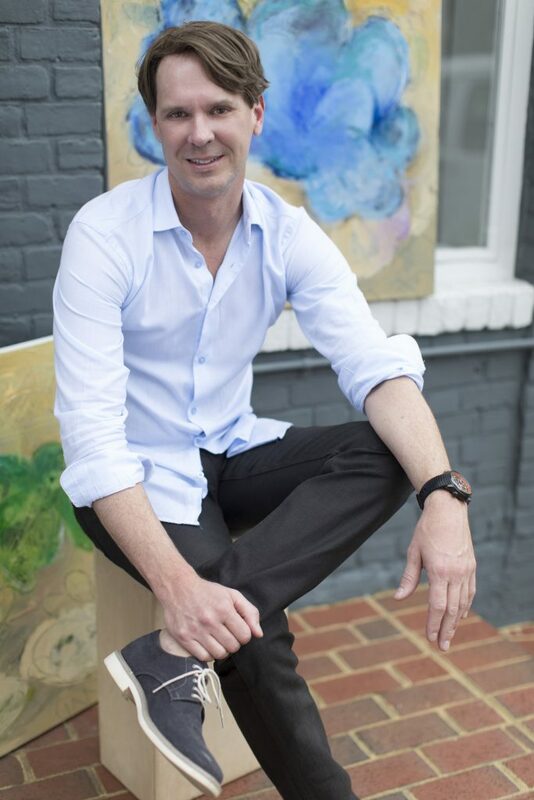 His work was featured in the Richmond Symphony Orchestra’s 2012 Designer House and a three-month solo salon at the Richmond corporate complex of Capital One. A selection of his paintings was juried for inclusion into William King Museum’s contemporary biennial, From These Hills: Contemporary Art in the Southern Appalachian Highlands, with juror Ray Kass; his Ombré.01.blue was selected by New York curator and art writer Doug McClemont for Roanoke College’s Olin Hall Galleries 2015 Biennial.Recent commissions include clients in Houston, San Francisco, Minneapolis, and Ontario. He is founding member and president of the Appalachian Spirit Artists Cooperative and was appointed to serve on advisory panels for the Virginia Commission for the Arts from 2010-2012 and from 2018-2020. Sarah Trundle is a Charlottesville, Va. painter whose paintings range from bold, geometric, brightly colored abstracts, to works of serene, monochromatic, minimalism. Each painting represents a unique end result of a constantly shifting process of obscuring and defining, of complicating and simplifying, and of using the surprises that emerge to inform each subsequent step. Sarah sees this push-pull process as an integral part of the finished painting. She strives to give the viewer a window into this struggle by leaving early marks, shifted shapes, and under-layers still visible to the viewer. 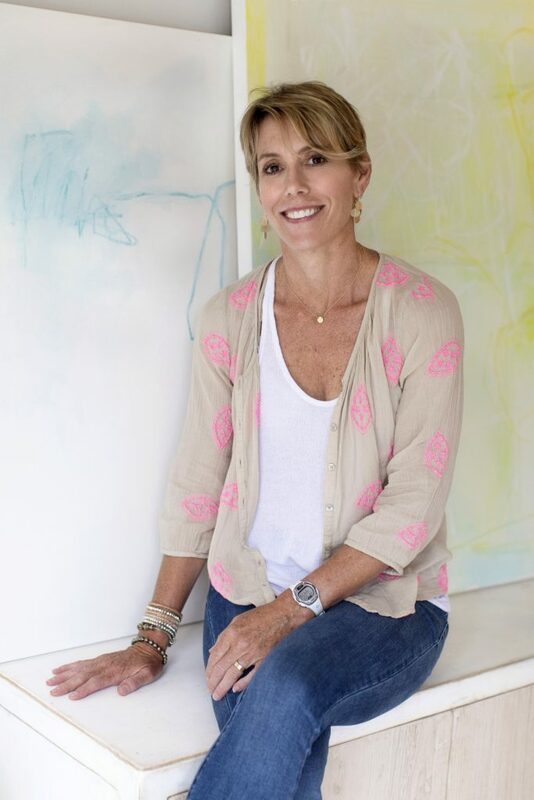 She is represented by several galleries nationwide and is honored to have her work in numerous private and public collections internationally. Sarah holds a bachelor’s degree in psychology from Dartmouth College and a Masters Degree in Social Work from Virginia Commonwealth University. She started her career as a full time artist after having worked many years as a mental health therapist (who always dabbled in art). 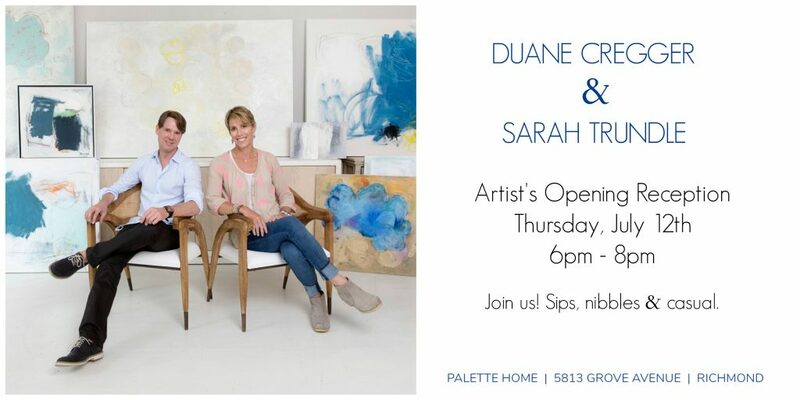 Paintings by Duane Cregger and Sarah Trundle are available for purchase at Palette Home Richmond until August 25th 2018. Please feel free to call or email to inquire size & pricing. We ship & insure.